If you create a document that you want to use again as a model for other documents, you can save it as a template. Creating your own template can be as simple as adding your company logo to an existing template, or you can design a completely new template. You can add your custom template to the template chooser, or save it as a file to share with others or to install and use on your iOS device. 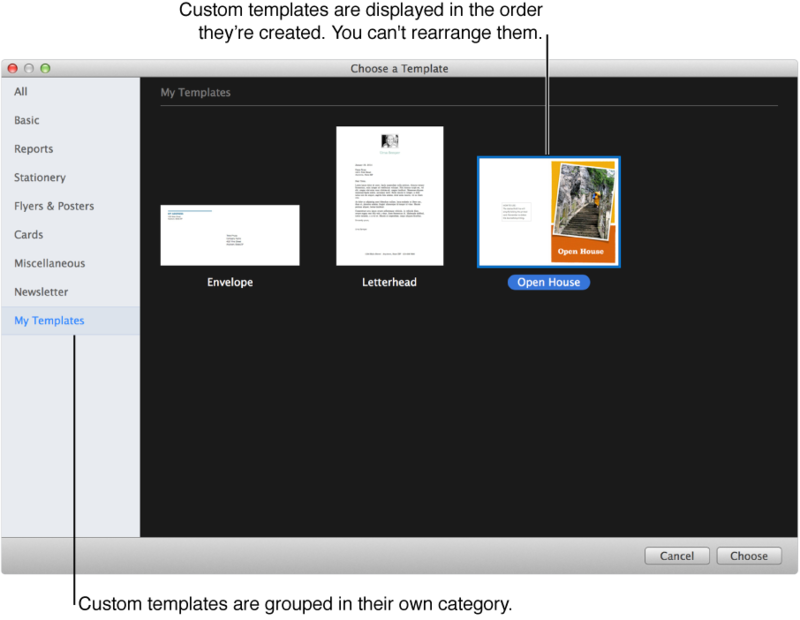 Note: If you send a template in Mail or save it to iCloud, the template is ready to install. If you save a template to a web server or upload it to webmail, the template file must have the file extension “.template.zip” to install it and use it in Pages on your iOS device. To compress a file (.zip is a compressed file), Control-click the template file, then choose Compress from the shortcut menu. Choose File > Save as Template (from the File menu at the top of your computer screen). Add to Template Chooser: Type a name for the template, then press Return. Your template appears in the My Templates category in the template chooser. Save: Type a name for the template, then choose where you want to save it. If you save it to iCloud, the next time you open Pages on your iOS device, the template appears as a downloadable file in the document manager. When you create a new template, you start with an existing template (Blank, or any other template), make changes, then save it as a custom template. The original template remains unchanged. Custom templates appear in the My Templates category in the template chooser. Note: Only templates that appear in the template chooser can be edited. If you want to edit a custom template that’s not in the template chooser, install it first (see the tasks below to learn how). In Pages, choose File > New (from the File menu at the top of your computer screen), then double-click the template you want to edit. Create a media placeholder: Select an image, then choose Format > Advanced > Define as Media Placeholder (from the Format menu at the top of your computer screen). Create a text placeholder: Select the text, then choose Format > Advanced > Define as Text Placeholder (from the Format menu at the top of your computer screen). Add a watermark or background object: Select the text or object, then choose Arrange > Section Masters > Move Object to Section Master (from the Arrange menu at the top of your computer screen). See Place objects in the background to learn more. If you save it to iCloud, the template appears as a downloadable file in the document manager the next time you open Pages on your iOS device. If you don’t want to keep the original template, you can delete it from the template chooser. You can’t delete templates that came with Pages. You can install a custom template saved to your computer or to a server, or a template that you received as an attachment in an email, by adding it to the template chooser in Pages. Note: Skip this task if you chose Add to Template Chooser when you saved your custom template; it’s already installed and can be found in My Templates. Double-click the template file (it has the file extension “.template”), then click Add to Template Chooser. You can set Pages to always open a new document from the same template instead of from the template chooser. Choose Pages > Preferences (from the Pages menu at the top of your computer screen). In the General pane, select “Use template,” then click Change Template to select a template. iCloud: If Pages is set up to use iCloud on your device, the template appears automatically in the document manager and is identified by a template badge. Tap the template thumbnail, then tap Add. An email: From Mail, tap the attachment, tap (you may need to tap the screen to see the Share icon), tap Open in Pages, then tap Open in Pages. Tap Add. A WebDAV server: Download the template from the server, tap (you may need to tap the screen to see the Share icon), then tap Open in Pages. Tap Add. The template appears in the My Templates category in the template chooser. In the template chooser, Control-click the template name, then choose Rename or Delete. If you’re renaming, type a new name, then press Return. Custom templates always appear in My Templates in the template chooser. You can’t rearrange templates, and you can’t delete templates that came with Pages. Note: You can’t apply a new template to an existing document. You can, however, change the document type (word processing or page layout).